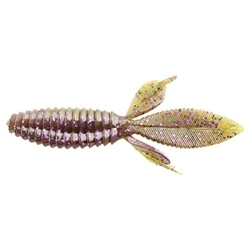 The Double Wide Beaver is the larger version of the very popular Sweet Beaver and is designed for flipping big fish. This bait moves a lot of water with the ribbing on the side, the large double paddle tail and the shorter paddles set at 90 degrees. The fantastic two and three color shots Reaction Innovations has been able to perfect gives these baits the intricate color patterns of a hand pour at the price of injected baits. If flipping heavy cover for big bass is part of your winning strategy, the Double Wide Beaver should be at the end of your line.